A hard wearing paint bucket you can count on. The paint bucket rim is reinforced with wire designed to keep its shape when carrying a heavy load. Lightweight plastic makes carrying this bucket full of paint a piece of cake. Great for cleaning brushes! This red plastic pail is made with food grade HDPE plastic that's safe for use with all paints, pastes and adhesives. Liquid quart measurements are raised engravings on the bucket interior. The classic versatility of this capable paint bucket is unlimited. 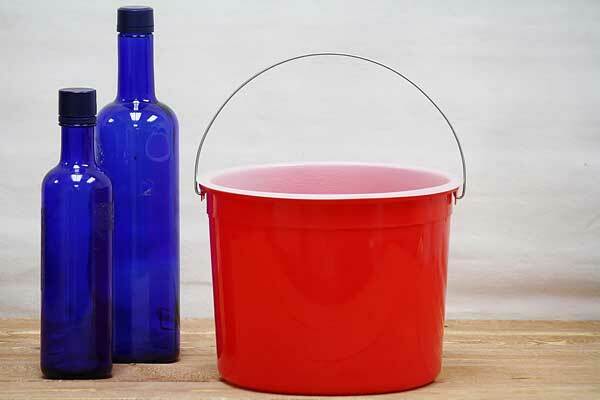 Make clean-up stress free with few practical plastic bucket liners. Purchase together, individually or separately. Don't forget to order a quality paint brush. Made in the USA. You might also like our metal paint pail with plastic liner. View our basic grey plastic paint pail with liner here.